TRANSLATED is a leading provider of translation and localization services in 80 languages to 4,000 customers around the world. We are offering 10% per sale, AND EVERT REPEAT SALE: if you send a customer who orders repeatedly, you will earn for life from just 1 referral! Banners available in English, Spanish, Italian, French, German, Portuguese, Chinese and Japanese. 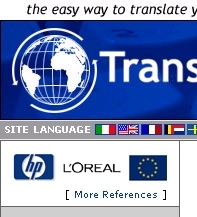 TRANSLATED is a leading language service provider. Our success stems from the innovative application of internet technology to the translation industry. Our core competencies in the language industry are translation in 80 languages, localization, workflow automation and natural language processing. Thanks to our affiliates, we serve 4,000 customers worldwide including HP, United Colors of Benetton and 20th Century Fox.